I’m very excited about wrestling in Holland in two weeks time, which marks my 19th country in the grappling game. More importantly, it marks my comeuppance against reigning Eurostars European wrestling champion and WNC champion, Bernard Vandamme of Belgium. It was just this past March 8 in Helsinki, Finland, that I unceremoniously lost Japan’s WNC (Wrestling New Classic) title to Vandamme in just under two-minutes, in what can be argued to be a huge upset. It made international headlines and it most definitely shocked every fan on hand at FCF Wrestling’s Talvisota VIII event that night. It left a bitter taste in my mouth, and for a moment, I thought I’d be getting my rematch for the WNC strap when I first heard about Dutch Pro Wrestling booking Vandamme as my opponent for June 1 on their biggest show of the year in Poeldijk, Holland. 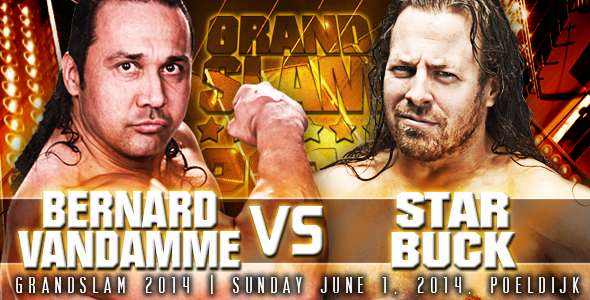 However, being that I am a former two-time Eurostars European champion myself, defeating and losing that championship to Vandamme in 2006-2007 and 2009, the Eurostars wrestling office decided it was time for StarBuck to get another shot at continental supremacy in Poeldijk at DPW’s Grandslam 2014 mega-event. This decision overrode Japan’s WNC organization’s rematch clause, and so, the June 1 match will be for the Eurostars title only, regardless of the fact that Vandamme is a double-champion at the moment. Personally speaking, I am highly looking forward to this showdown. Vandamme and I have a long and storied history, going back to 2006, when we first locked horns. We have had a tenacious feud, one that has spanned from west to east, from Europe to Asia, and like the proverbial thorn in my side, Vandamme is still prevalent as an adversary in my career eight years later. I will be more than ready to strip Vandamme of his Eurostars European title on June 1, just as he stripped me of the WNC gold a few months back. I will walk into Grandslam 2014 and let loose the full measure of my personal vindication and wrath on the person of Bernard Vandamme, and I will walk out of Poeldijk as the new Eurostars champion. How’s that for “an eye for an eye”, Bernard? Deal with it!